A retired Russian secret service officer has been sentenced to 13 years in prison for spying for Britain. Col Sergei Skripal was convicted by a Moscow military court of passing the identities of Russian intelligence agents working undercover in Europe. 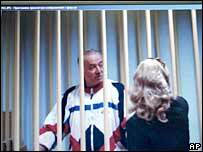 Prosecutors said he had been cooperating with the British secret service MI6 since the 1990s. Russian officials said he was paid some $100,000 (£78,000) for the information. UK officials have not yet commented. Col Skripal was convicted of "high treason in the form of espionage". Col Skripal, 55, began working for the British secret services while serving in the army in the 1990s, Russia's security service FSB said in a statement. He had been passing information classified as state secrets, the statement said. The military court's spokesman, Yevgeny Komissarov, told the AFP news agency that MI6 had made payments to Col Skripal by transferring money to a bank account in Spain each time he gave information. The meetings between Col Skripal and MI6 agents took place between 1995 and December 2004, when he was arrested, the spokesman said. The trial's chief military prosecutor said he was satisfied with the court's verdict. "The conviction of Skripal is lawful and justified," Sergei Fridinsky was quoted as saying by Russia's RIA-Novosti news agency. Col Skripal faced a maximum of 15 years in jail. The charges and the trial were only made public on Wednesday. The sentence comes just months after Moscow and London found themselves engaged in another spy scandal. In January, Russia accused four British diplomats of using a wireless device planted in a fake rock to receive classified information from their agents in Moscow. In that case, British diplomats were also said to have been making regular payments to Russian opposition non-governmental organisations. Now no politics seem to be involved, but the case of Col Skripal could well put an additional strain on relations between Moscow and London, the BBC's Artyom Liss in Moscow says.